Although the decrease makes for a much less pleasant investigation than our analysis of Pet Food, it is necessary. We’ll “drill down” into the data to try to determine what and who are “behind” this big change. As you can see, Supplies showed strong growth in 2014. Then in 2015 they started to decline. It began early in the year and was pretty steady – a drop of $1.15B in the first half and $0.95B in the second half vs 2014. Let’s consider some relevant happenings in the overall Pet Market in 2015. This segment has many categories which have become “commoditized”. A high percentage of the purchases are “discretionary”, rather than “need” based, like food. These products can be sensitive to price changes. The Consumer Price Index for Pet Supplies rose steadily for the first 9 months of 2015 then “plummeted” in October-November (a record drop). The drop may have been a result of retailers trying to make up for months of depressed sales. It may have helped …but wasn’t nearly enough. 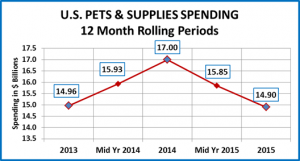 Pet Food Spending was taking off like a rocket in 2015. Virtually all U.S. households have a spending “limit”. A radical increase in Food Spending may have caused Pet Parents, consciously or unconsciously, to cut back in spending in other segments – especially discretionary $ in Supplies. Another factor in the Food Increase was the growth of Meds/Supplements in the form of Treats. If a Pet Parent switched from pills/powders to treats, this would move their dollars from Supplies to Food. Innovation – One sure way to get consumers to spend more money is to produce new products that “make a difference” in their role as Pet Parents. If it is definitely better or easier, they will spend more. Based upon the spending, It doesn’t appear that there were many new “must haves” in the Segment. These are some possible reasons behind the decline. Now let’s look at “who” spent less. First, by Income level. Observations: Spending is down in all groups. It’s just a matter of how much. There is not a distinct pattern. $30K>$99K (46.5% of H/H’s)- $6.33B, Down -$1.33B (-17.4%). This middle income, value conscious group seems to have been impacted the most as they were responsible for 63% of the spending drop. $100K>$149K (12.2% of H/H’s) – $3.09B, Down -$0.01B (-0.04%). This group has the only “almost positive” story in the income group demographic category, as their spending was essentially flat. Let’s take a look at the spending by Age Group. 45>54 (18.9% of H/H’s) $143.69 per H/H – $3.48B – Down -$0.65B (-15.6%) This group has the highest income and overall expenditures and…spends the most on Pet Supplies. They had a $1.73B increase in spending in the other Pet Segments which could be a factor in the drop in discretionary Supply spending. They bought supplies 13% less often. 35>45 (16.4% of H/H’s) $113.70 per H/H – $2.45B – Down -$0.59B (-19.4%) This group is second in income and overall expenditures. They also have the biggest families. Pet Spending is only 0.72% of their total expenditures, while the national average is 0.94%. It is a recipe for price sensitivity in their pet supplies buying decisions. They bought Supplies 15% less often. 25<34 (16.4% of H/H’s) $127.31per H/H – $2.68B – Down -$0.18B (-6.4%) They have price pressure – starting families and careers. They actually bought Supplies 8% more often but spent 16% less. 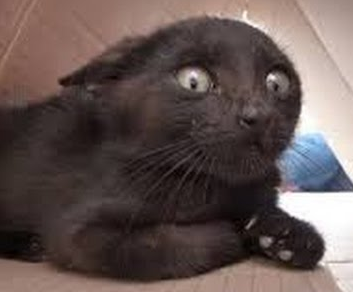 <25 (5.9% of H/H’s) $64.00 per H/H – $0.49B – Down -$0.02B (-4.1%) They are acquiring pets. They actually increased their H/H spending on Supplies. However, there were 9% fewer H/H’s. 55>64 (18.8% of H/H’s) $139.31 per H/H – $3.36B – Down -$0.2B (-5.7%) This group spent $5B more on Food so it’s not surprising that Supplies are down. However, these are “Boomers”. They actually spent 7% more…just 16% less often. 65>74 (13.5% of H/H’s) $109.05 per H/H – $1.89B – Down -$0.35B (15.7%). This group also spent a lot more on Food but with a bigger impact on Supplies. They spent 9% less on Supplies…10% less often. 75> (9.8% of H/H’s) $44.01 per H/H – $0.56B – Down -0.11B (-16.6%) They spent 10.8% less and 9% less often. They are still trying to hang on as Pet Parents. They actually doubled Veterinary Spending. Summary: The drop in Supply Spending is so pervasive across the U.S. that it is difficult to point to a specific “who” behind the behavior. Home owners, 2+ People H/H’s, Married Couples with children – these are the core of the Pet Industry and they are all down – big time. About the only H/H likely to be up in Supply spending was a single person, working as a Manager or Professional, renting an apartment in the Center City in the Western U.S. – not exactly what we have come to recognize as the “ideal” Pet Parent Spending Household. Basically, this puts the “onus” on “what” to explain the decline. When you do that, you have to come back to money. While some demographic segments have greater “economic” pressure than others, price has become the #1 factor (75%) in the buying decisions in America. Also, almost everyone, at every income level, lives on a budget. If you spend more in one area, then less money is available for other spending. The Supply Segment is different from Food. While some Supplies are necessities, a lot are discretionary and impulse can also be a big factor. The CPI on Supplies rose for the first 9 months of 2015. This invariably depresses sales for “commoditized”, discretionary items. 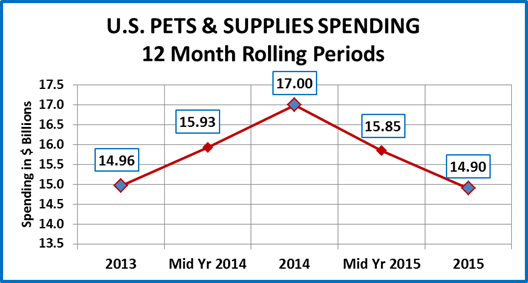 At the same time, Pet Food Spending took off and Veterinary Spending went up $2B in the Second Half of 2015. These are both “need” expenditures and can depress spending on discretionary items. A truly key fact that came out in the investigation was the drop in frequency of Supplies Spending. Pet Parents spent 4% less but…they bought 10% less often –that’s a big deal. So what can be done? The surest “fix” is innovation. Consumers will spend more if a product is demonstrably better or makes Pet Parenting easier. However, this takes a lot of thought and effort. Are you ready to get started? What about the “Boomers”? They are 34.4% of the H/H’s. They spent 48.5% of the total Food & Supply $…and they’ll pay for better! How can you make life easier for this huge group of aging Pet Parents?